Can Stress or Emotions Cause Pain? I received a great question from a patient recently: She had read somewhere that stress and emotions were the cause of back pain, and wondered if I agreed or if it was true. Here is the majority of my answer. While not the only cause of pain, the relationship between mental/emotional complaints or stress and how they lead to various physical conditions has long been known. The technical term for it is “psychosomatic,” or “psychogenic,” and refers to physical complaints being caused by mental/emotional problems. As our world has gotten busier and busier, and we have gotten away from stress-reducing activities in our daily life, these psychosomatic conditions have become much more widespread. Unfortunately, addressing psychosomatic conditions is difficult for several reasons. First, psychosomatic complaints can be varied in their expression. Some people experience headaches when stressed, while others will develop back pain. Still others will suffer from indigestion… or high blood pressure… or neuropathy… or constipation… panic attacks… etc. Because of this highly variable presentation, it is difficult to determine exactly when our conditions are psychogenic in nature or when there is a true underlying disease process. In addition, there are no real tests that can be performed or evaluated to definitively diagnose psychosomatic conditions. Therefore, we are often in a position where we must run a multitude of tests and evaluations to rule out more serious complications or underlying disease processes. When these tests, inevitably, show no evidence of other causes, by exclusion the only plausible remaining diagnosis is “psychosomatic.” However, the very process of so many tests, the costs associated with these tests, and the continual disappointment of another test without an answer… only adds to the stress that is ultimately the underlying cause! Second, when we have confirmed that stress is either the primary underlying cause or just a complicating factor, it is extremely difficult to get patients to comply with our recommendations on how to reduce that stress. Regardless of whether a physician is involved or not, a person who recognizes that stress is the culprit will often be unwilling (or unable) to take the necessary steps to correct their situation. How many of us can change occupations at will? Which of us can rapidly make money problems disappear? Who among us chooses when to deal with a dying parent? Which of us set our own work hours? And on and on… However, there are a great many things that we can do, but are often unwilling. For example: How many of us turn the television off and read a book in the evening? How many of us go to bed early with some soft, soothing music? How many of us choose nutritious snacks instead of sugary, carbohydrate-rich junk? Who do you know that closes their eyes and rests for fifteen minutes at lunch instead of checking in on Facebook? How many of us go for a walk in the evening instead of watching American Idol? Stress is largely a direct effect of the choices we make, our response to the consequences of those choices, and our willingness or ability to change those choices. Third, our traditional Western medical system is not designed to properly address or correct psychosomatic conditions. If you look at the above complaints we noted above, think about how those conditions are primarily treated. Headache? Take Excedrin. Back pain? Take Alleve. Indigestion? Take Prevacid. High blood pressure? Take Toprol. Neuropathy? Take Gabapentin. Constipation? Take Maalox. Panic attacks? Take Prozac. Are you seeing the pattern here? And don’t blame this entirely on doctors or the pharmaceutical companies… Nearly every one of the conditions I’ve listed are lifestyle-related. In other words, choices the patient has made have led to the conditions with which they are suffering. By extension, patients demand and choose a treatment alternative that allows them to go on making the same ill-fated choices. Unfortunately, our Western medical system is largely geared towards symptom control… not dysfunction correction. So, can mental or emotional stress cause pain? Absolutely. It can cause a great many things other than just pain, so it is important to make stress-reduction a regular part of your daily life. So… how many chiropractors does it take to change a lightbulb? Just one… but it’ll take you 40 visits! Although comical, jokes like this come from a general basis of some perceived negative. Does it really take forty visits anytime you need chiropractic treatment? Of course not. However, there is another perception about chiropractic that contributes to the above joke: Once you start going to a chiropractor, you have to go forever. Is that true? Do you have to go forever if you begin seeing a chiropractor? The answer, again, is of course not. I’ll be the first to admit that I understand the frustration with the concept of multiple visits associated with chiropractic treatment. The fact remains, though, that we can’t fix twenty years of abuse and neglect with one adjustment. The number of treatment visits that will be required for each individual case is dependent on many factors. An individual’s history of injuries, surgeries, sports, genetics, occupation, exercise, weight, diet, hobbies, etc. all play a role in the amount of treatment necessary. The length of time that a particular condition has been developing is also extremely important when trying to design a treatment plan. Every aspect plays a role in determining reasonable expectations for the amount of care necessary to optimize outcomes. Perhaps more, but at least as, important than the above factors is: What are the patient’s goals? If all the patient wants is to “feel better,” then a couple appointments may be all that is necessary. But, keep in mind that how things feel is not always a good indicator of how things really are. Did you know that the most common first symptom of heart disease is… death? There are tons of people walking around with severe heart disease or cancer who have no symptoms and think they’re fine. In the same sense, your spine and nervous system has an inborn ability to adapt and compensate for dysfunction in an effort to decrease symptoms. Think about it… from the time we learn to walk, our parents teach us how to ignore pain. “Shake it off… be tough… work it out…” From nearly day one, we are taught to ignore our symptoms! The end result is that we ignore the warning signs that would allow us to fix a problem while it is small and easy. Ultimately, by the time the body has lost its ability to compensate any further, the patient enters my office and says, “I’ve only had this pain for three days.” Well, actually, you’ve had this dysfunction for much longer, but your body finally gave up three days ago. If the patient’s goal is resolution or long-term improved health, then physical pain or symptoms are only a small part of our rationale for care. Obviously, our first goal of treatment will be to minimize and/or get rid of the pain. After that, we dig a little deeper to determine what led to the dysfunction in the first place. While continuing care and retraining the body to work and function differently than it has adapted to, we begin planning out any rehabilitative care or lifestyle changes that may be necessary. This could include regular stretching and/or exercise at home, dietary restrictions, supplements, physical therapy, ergonomic changes at work or home, etc. Beyond that, again, it depends on the patient’s goals. If you wish to keep your teeth and keep them healthy, you regularly brush, floss, use a mouth rinse, and visit the dentist a couple times per year regardless of symptoms. These visits are primarily check-ups so that the dentist can discover potential problems before they become big problems. A little cleaning, a good check-up, some advice on home care, and they can usually send you on your way. However, if you’ve not been taking care of your teeth, whether by the lack of maintenance or by abusing them with sugary foods, then the dentist may have some work to do. If you’re seeing him a couple times per year, then he can catch these problems early and there is much less treatment and cost involved. On the other hand, if you’ve neglected these problems for some time, the damage may be much worse, increasing the amount of treatment and cost involved with your dental care. Symptoms… Or Structure? Are You The Leaning Tower? Take your shirt off… Relax… and stand in front of a large mirror. Are your ears level? Does your head stand straight up and down? Are your shoulders level? Do your ribs stick out further on one side? Are your hips level? Now, do the same thing on your children, spouse, or significant other. If you can answer “No” to any of these questions, you may be looking at a clear sign of problems to come… or the underlying cause of some of your current problems. Biomechanically, our bodies are built like a skyscraper. We are a very tall, narrow structure that depends on a stable foundation with balance and support throughout from the bottom up. Anytime the pieces aren’t working together, or individual parts are weaker than they need to be, dysfunction shows up. The Leaning Tower of Pisa was built upon a sandy foundation. As they built it taller, they began to notice that it was leaning to one side. Instead of correcting the foundation, they treated the symptom… they built the next level taller on one side to shift the weight back the other way. As expected, the building first righted itself, but then began to fall the other way. Again, they just built the next level out of balance to shift the weight back in the other direction. This continued for nearly 200 years until they arrived at the structure you see today. What many of us don’t know is that the only reason the tower still stands is because of the internal and external “surgery” they eventually had to perform to hold the building up. There are metal bands, support beams, lead weights, and traction devices that have been installed and are constantly monitored and adjusted in order to keep the building upright. In the same fashion, structural dysfunction in our body will lead to imbalances that force it to adapt and lean this way or that in order to continue to support us. The changes or adaptations our bodies make may allow us to remain upright, but they will also lead to other symptoms. Symptoms are nothing more than our body’s attempt to warn us that something is wrong. In our example, the symptom of the leaning tower was an indication that the foundation wasn’t strong enough to hold the weight of the building. In our body, the symptom could be achy, muscle spasms. How many of us decide to take a muscle relaxer or anti-inflammatory instead of asking ourselves why the pain and spasm developed in the first place? If your symptoms involve interference in the nervous system… which then leads to symptoms wherever those nerves travel… what will happen if you choose to treat the symptoms only? 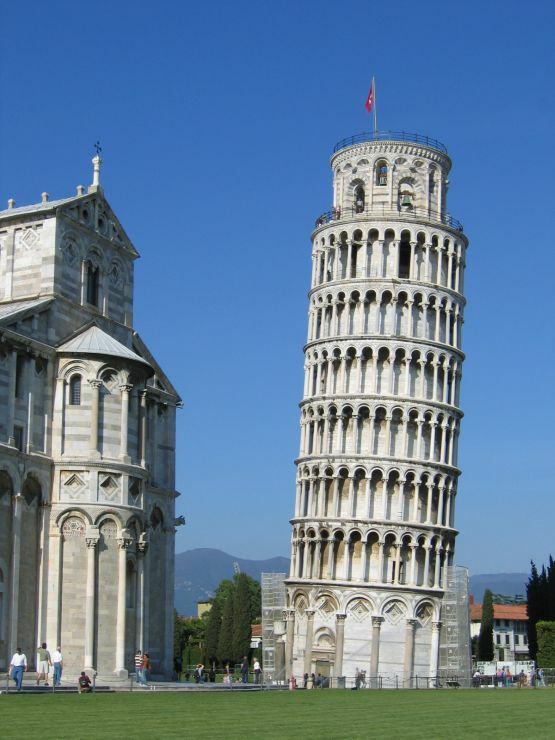 Go back to our analogy: As the builders continued to treat the symptom of the leaning tower, this only led to other symptoms and perpetuated the instability and dysfunction of the structure. Ultimately, this has led to permanent structural imbalance (the lean), surgical repair (the banding and beams), and constant monitoring of balance (the lead weights and soil removal). Following this logic, if you choose to treat the symptoms only, you will develop permanent structural imbalance (have you seen how some older people stand? ), increasing aggressiveness of treatment (how many knee and hip replacements have you heard of lately? ), and constant monitoring and treatment (know anyone taking meds for one thing… then meds for the side effects… then meds for another… OR… needs continual or repetitive treatment just to maintain their current state?). Sounds pretty familiar, huh? Chiropractic is uniquely situated and qualified to deal with the underlying structure of how our bodies work. Most people think of low back pain when they hear “chiropractic.” However, chiropractors don’t treat low back pain. We don’t treat headaches… neck pain… indigestion or heartburn… carpal tunnel syndrome… intervertebral disks, herniated disks, bulging disks… We treat the underlying CAUSE that leads to those SYMPTOMS. We seek to optimize the body’s function, therefore the symptoms resolve themselves. If a “symptom” is just a warning sign given by our body to warn us of dysfunction, then correcting the underlying dysfunction will cause the symptom to stop. Is chiropractic a cure-all? No. Of course not. There are conditions or diseases that are related to external forces (such as infection, trauma, or chemical poisoning) that need external assistance. Your medical doctor plays an integral role in helping to address these issues, and to help point you in the right direction. However, your chiropractor should play an equal role in helping you manage the function of your body. Ultimately, you are responsible to create and build your own foundation upon which you build your structure. When we are young, we rely on the foundation begun by our parents, but as an adult, will you continue to treat the symptoms? Will you treat only the symptoms, or will you correct the underlying structure? Evaluate the state of your body, even if you have no pain. Even people who feel fine have areas of their spine or extremities that are out of normal alignment. When we adjust those bones back into place, people feel better in some way. If we waited until we felt pain, we would all wait until we needed root canals or crowns before going to the dentist! Address major or minor pains you currently have, but haven’t been too worried about. Have you had any nagging discomforts or pains coming from your spine or extremities? Do these discomforts prevent you from doing the activities you enjoy? Instead of wondering if the pain will continue to get worse or stay that way for the rest of your life, give chiropractic a try. You don’t have to live with pain. Prevent future problems that can and likely will arise from your joints being out of alignment and not functioning at 100 percent. Our society is moving toward preventative health care. Chiropractic has been at the forefront of this concept since the chiropractic profession was founded in 1895. Arthritis, overuse injuries (like carpal tunnel syndrome and tennis elbow), rotator cuff injuries and knee problems are just some examples of conditions that may be prevented with chiropractic care. The most prevalent causes of death in this country are heart disease, cancer, and stroke. What is the first symptom most of those people that die of those diseases experience? … Death! Unfortunately, that’s true. Many that die of those diseases never know they’re sick until it’s too late. Think about it… how many people are walking around feeling fine, yet have a stage 3 cancer growing inside? We see cases on a daily basis where a lower back pain began with a simple movement, like getting in the car, or picking up a pencil, or mowing the lawn. Only after further investigation do we discover that they’ve had degenerative joint disease developing inside for several years. Scheduling chiropractic tuneups allows you to take care of your body so that your machine functions as well as it possibly can. Please remember to make time to care for yourself; you are worth every penny. Call your chiropractor today. What’s More Important… Your Car or Your Body? What may seem like a fairly ridiculous question, in reality is not quite so simple. You may scoff and say, “Well, of course my body is more important,” but do you really believe that? If you do believe it, do you act on it? Are you being true to your beliefs, or are you just giving it lip-service? Are you a hypocrite? That’s a tough question, but a valid one if you really think about it. Hypocrisy refers to believing and preaching one set of beliefs, yet not acting in a way that supports those beliefs. What do you think of politicians who claim their policies will be good for people… but won’t subject themselves to the same programs? What do you think of judgmental preachers who are found to be adulterous? What do you think of snarky people gossiping about others, while being guilty of the same offense? What would you think of a health-conscious, diet guru who weighed 300 pounds? These are all examples of people who claim to believe one way, yet act another. Nearly every day, we use our vehicles for something. Going to the store… taking the kids to practice… driving to school… getting to work… going on vacation… visiting relatives… a ton of our activities revolve around our ability to get from point A to point B, and we use our cars to do it. When is the last time you changed your oil? More important, why did you change the oil? Did you hear metal grinding together in the engine? Were you having trouble getting the car to start or stay running? Was your gas mileage dropping? Did your “Check Engine” light come on? These are just symptoms of bad oil or engine trouble, so why would you change the oil if none of these things were happening? Most likely, you just know that it’s wise to change the oil every 3,000 to 5,000 miles. We do this because we don’t want metal to start grinding in the engine. We don’t want to have difficulty starting the car. We don’t want our gas mileage to drop, or the “Check Engine” light to come on. Does changing the oil guarantee that none of these things will happen? Of course not, but it greatly diminishes the chance that they will. It also makes the car run better, operate more efficiently, and leads to a more pleasant experience by getting you from point A to point B without a bunch of hassles. There is another functional item that you use everyday. In fact, you use this item much more than you could ever think of using your car. This item is, of course, your body. So, when was the last time you got a tune-up? Nope. Not talking about the car anymore. When is the last time you got a tune-up for your body? Do you wait for symptoms to show up before you decide to do something about it? When they do, do you unplug the “Check Engine” light by just treating the symptoms, or do you seek the underlying cause of the symptoms? Like changing your oil, spinal tune-ups are an essential part of taking care of your body. Will regular tune-ups guarantee that you won’t have back pain or other complications? Of course not, but it will greatly diminish the chance that you will. (sound familiar?) Like a car, much of the work of the human body happens without us even realizing what’s going on. Our brain sends signals down the spinal cord to all parts of our body. When the body wants to move any of its parts, it contracts muscles, those muscles pull on the bones and movement happens. There cannot be muscular contraction without the bones moving in some way. When you take your car in for a tuneup, the mechanic analyzes the inner workings of the engine and other aspects that make the car function well. The same happens when you bring your body into the chiropractor for a tune-up. Chiropractors are trained experts in the way the bones, muscles and nerves function together. We can analyze almost every single joint in your body and determine if each one is working as it should. So, if regular maintenance is good enough for your car, do you consider your body as important? If your car breaks down permanently, you can replace it with another one, but what are you going to do if your body breaks down? Most permanent changes in the body take place slowly over several years. By the time you begin to experience symptoms, permanent changes have often already begun. When you’re 80… do you want to be the cleaned up hotrod still rockin’ the town, or the rusted-out clunker in the scrap yard? There’s no better time to begin treating your body with the respect it deserves and the maintenance it needs than today. Set an appointment with your chiropractor and let him know you’re ready to start getting your tune-ups. How do I say this…? NO! Absolutely not! Are you crazy? I saw a research paper a few years ago that detailed the activities and health history of centenarians (people 100 years old or older). They had black, white, asian, male, female, European, American, Chinese, Japanese, Indian, thin, heavy (only a couple of these), recent, historical, etc. Want to know what the only thing they all had in common? That’s right. Walking. Something that seems so simple, yet is so profound in its health benefits. Now, I’m not so naive to think that walking was the only thing these people were doing, however, that was the one thing they all had in common. Most participated in other forms of exercise, watched their diet, and efficiently dealt with stress, but their lifestyles, backgrounds, and ethnicities varied across the board. Physical activity was the only common denominator. How many times have you seen an older person who’s still active, busy, driving, and looks healthy… and then seen another person who was significantly younger who looked like they were on death’s door? Why do you think the older, healthier person is still able to do so much while the younger was so limited? Due to hundreds of studies and experiments, we know it’s the exercise, activity, and healthy lifestyle, but I think there’s more to it than that. I think one of the biggest contributing factors is willpower. Willpower is the ability to exert one’s will over one’s actions. In other words, the ability to be decisive, determined, and persistent. Older people who remain active and vibrant are not perfect… they are not completely without pain or disease… they don’t feel great everyday… but they do have the willpower to get up and keep going regardless of how they feel. You’re never too old to live healthy. Changes in diet and the addition of exercise into your lifestyle can make significant differences to your health and overall wellness. In a study published in the Journal of Aging and Health and conducted at the University of South Florida School of Aging, Professor Ross Andel and co-researcher Robert Simons, executive director of the Bonsai Holistic Spa and Wellness Center in Largo, Florida, demonstrated a noticeable increase in body strength, flexibility, balance and agility in study participants. The 64 volunteers, ranging in age from 66 to 96, were divided into a walking group, a resistance training group and a control group that did not exercise. In the training group, warm-ups, stretching and flexibility exercises were followed by workouts on resistance training equipment. 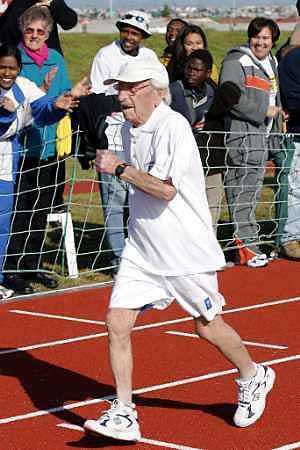 Reference: Simons R, Andel R. The effects of resistance training and walking on functional fitness in advanced old age. Journal of Aging and Health 2006;18(1):91-105. 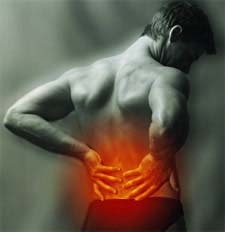 Activity or Bed Rest For Low Back Pain? Considerable evidence in the past decade shows that bed rest is not beneficial to patients suffering from low back pain (LBP). However, the clinical relevance of these findings has been questioned because previous research did not differentiate between different types of LBP. Some speculation has also been put forth that because the supine position minimizes intradiscal pressure, bed rest may have different effects on LBP patients with vs. without sciatica. This review by the Cochrane Collaboration Back Review Group analyzed all randomized studies up to March 2003, yielding two new trials comparing advice to rest in bed with advice to stay active for patients with LBP. Two reviewers independently assessed methodologic quality and extracted relevant data from the trials. In total, six trials compared bed rest with staying active for the management of LBP. Advice to rest in bed is clearly less effective than advice to stay active for patients with acute simple LBP. There is high-quality evidence for small but consistent differences in favor of staying active for pain and functional status at 3-4 weeks follow-up. And at 12 weeks follow-up. For patients with sciatica, there is moderate-quality evidence that advice to rest in bed has little or no effect on pain and functional status compared to stay-active advice at 3-4 weeks and 12 weeks. For patients with acute simple LBP, there is high-quality evidence that advice to rest in bed will increase length of sick leave in the first 12 weeks, compared to advice to stay active. For patients with sciatica, advice to rest in bed has little or no effect on the length of sick leave compared to advice to stay active (based on moderate-quality evidence). For patients with confirmed nerve root involvement, there are few or no differences between advice to rest in bed and advice to stay active. Reference: Hagen KB, Jamtvedt G, Hilde G, Winnem MF. The updated Cochrane Review of bed rest for low back pain and sciatica. Spine, March 1, 2005;30(5):542-46. In other words… for simple cases of lower back pain, your best bet is to stay active, stretch it out, and don’t baby it too much. If it is more complicated or involves the nerve roots, chiropractic care is your first line of defense. In a 2004 study published in the Journal of Manipulative and Physiological Therapeutics, two separate groups of patients were treated with chiropractic care for the resolution of lower back pain. One group was treated for one month only, and then checked nine months later. The other group was treated with chiropractic care for one month, and then with periodic maintenance-style chiropractic care for the next nine months. Although both groups showed significant decreases in lower back pain scores after the first set of treatments, the group that received maintenance care fared much better by the end of the study. Disability scores in the group that received maintenance care were significant lower after the ten month trial period. However, in the group that did not receive maintenance care, disability scores gradually returned to pretreatment levels. Based on these results, it is clear that regular chiropractic care not only helps reduce LBP and disability associated with LBP, but that continued chiropractic treatment following the acute treatment phase assists in keeping pain from recurring. I am often asked whether regular maintenance or supportive care is “really necessary.” My honest answer to this is, “No. It’s not necessary... but, it is advisable.” Relief from complaints lasts longer, and there are fewer incidences of recurrence. As this study shows, there is a significant benefit in time lost from work and daily activities if you engage in preventative and supportive care. In this economy, the last thing you want to do is miss time from work. Not only do you miss the extra cash when it comes paycheck time, but you also become known as “the guy who misses work due to his back.” When you’re that guy, yours is one of the first jobs on the chopping block. Think about it… 1) Their business is hampered because of your time off work; 2) They’re at more risk for workman’s comp injuries; and 3) Your repetitive condition could lead to increased insurance rates costing everyone more money. Here is a quote that should give you something to think about: In health care, there is nothing more costly than treatment you don’t need, but take anyway… or the treatment you do need, but don’t. That’s a pretty profound statement when you consider the advancements in healthcare over the past hundred years. I am regularly asked to explain acupuncture to our patients. I’ve decided… that there’s really no easy way to describe it! Yes, there are varied canned responses and textbook definitions, but they, too, are filled with theories and assumptions. Personally, I think the study of acupuncture and what we know of it is about to explode. We have come so far in the ability to measure energy, magnetism, electromagnetic fields, bioelectricity, etc. I think we are going to find definitive and measurable proof that there is, indeed, a network of energy (innate, chi, qi, etc.) that affects and plays a role in the autonomic functions of the body. Recent studies have documented near instantaneous reactions within the brain and nervous system following stimulation of seemingly far removed acupoints. Although these reactions are documented, the underlying etiology of why or how they occur is not fully understood. Compare this to aspirin. For the first 40 or so years, scientists had no idea how or why aspirin worked to relieve pain and inflammation. However, it became the most widely used pain reliever in the world. Why?… Because it worked! With acupuncture, the only difference is time frame. Although the underlying etiology is not completely understood, it works! For over 5,000 years, acupuncture has been taught, studied, and practiced with widespread success and positive treatment outcomes. As with other treatment methods or options, acupuncture is not a panacea. It will not work for everyone or every case, but there are a ton of conditions and scenarios when acupuncture will be the most effective treatment method available. In one recent case, I had an elderly gentleman that we had been fighting a case of severe hip pain. Now, this may not be typical, but after one treatment, he was nearly pain free in the hip. Why did his case respond so well to acupuncture when it had failed to respond to so many other treatment methods? I’m not sure. What I do know is that acupuncture is what his body needed. Although you may not need acupuncture for every single case, for those cases that need acupuncture… you won’t get optimum results without it.